007’s nimble solution to aerial reconnaissance was a tethered hang glider, which he presumably had lifted along by Quarrel Junior’s boat in a paragliding fashion, before release and a gentle descent. German engineer Otto Lilienthal, is credited with inventing the hang glider in 1889, but it wasn’t until the fascination with flight led early aviation pioneers to experiment in the 1920s that the designs likely to work in any reliable fashion. In 1957, NASA engineers developed the Rogallo Wing – a flexible wing that was to be used to help space capsules land without smashing into thousands of pieces. In 1961, American engineer Barry Palmer launched a Rogallo Wing Glider by foot for the first time. This sparked a decade of innovation and during this period John Dickenson, and Australian engineer, designed the Ski Wing, which would be later credited as the first proper hang glider. Californian Jack Lambie was a respected inventor and innovator that got involved during this period and developed what was called a Hang Loose Chanute Hang Glider. He also organised the Otto Lilienthal Universal Hang Glider Championships in 1971. Bond’s use of what would be described as a Paraglider first and then a Hang Glider was not surprising – all the cool kids were having a go - it was one of the first extreme sports to capture the public’s imagination. Paragliding Days are available at a variety of experience day companies, as detailed below. 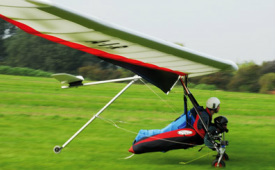 However, if you want to buy your own, it is worth visiting the British Hang Gliding Association for advice of clubs, where you can do it and general advice about the extreme sport. 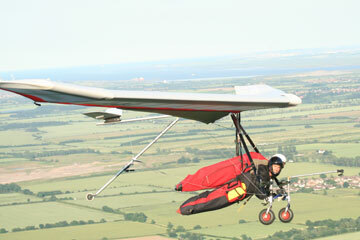 You can buy your own Hang Glider for less than £1,000.